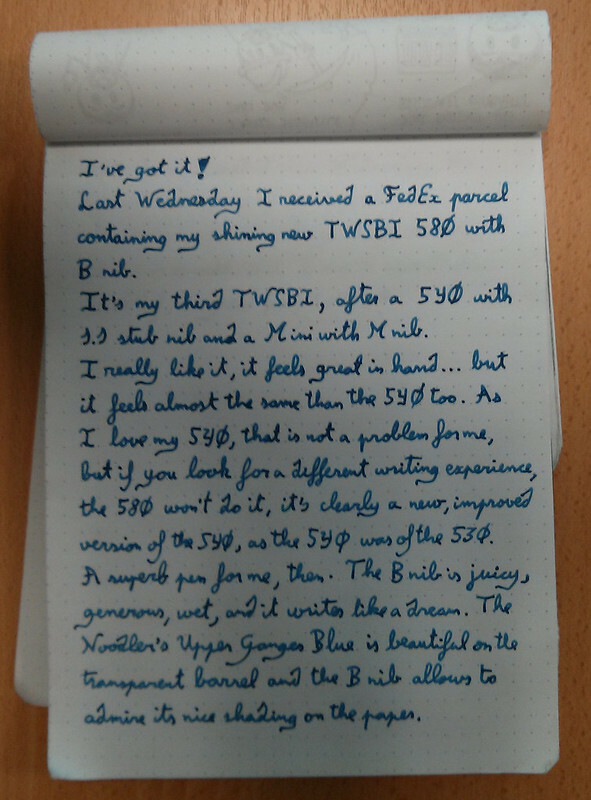 Last Wednesday I received a FedEx parcel containing my shining new TWSBI 580 fountain pen with B nib. 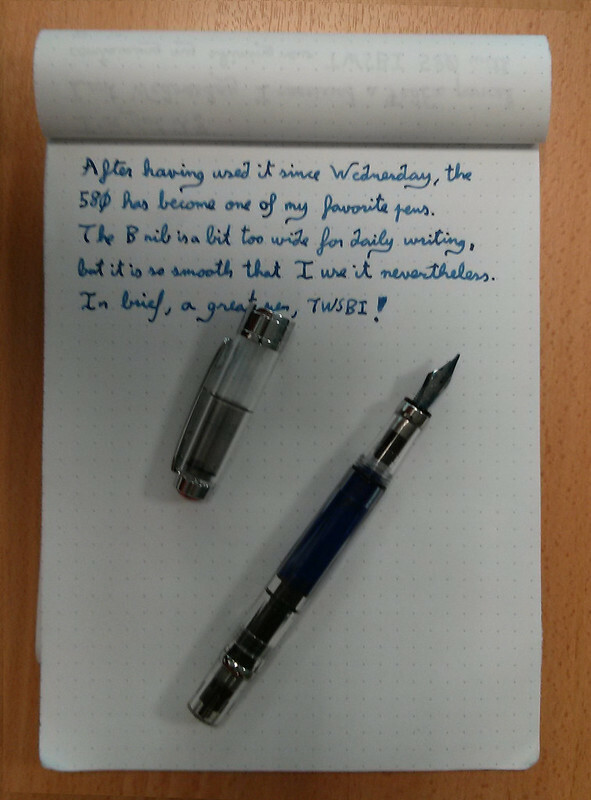 It's my third TWSBI, after a 540 with 1.1 stub and a Mini with M nib. I really like it, it feels great in hand... bit it feels almost the same that the 540 too. As I love my 540, that's not a problem for me, but if you look for a different writing experience, the 580 won't do it, it's clearly a new, improved version of the 540, as the 540 was of the 530. A superb pen for me, the,. The B nib is juicy, generous, wet, and it writes like a dream. The Noodler's Upper Ganges Blue is beautiful in the transparent barrel, and the B nib allows to admire its nice shading on the paper. After having used it since Wednesday, the 580 has become one of my favourite pens. The B nib is a bit too wide for daily use, but it is so smooth that I use it nevertheless. 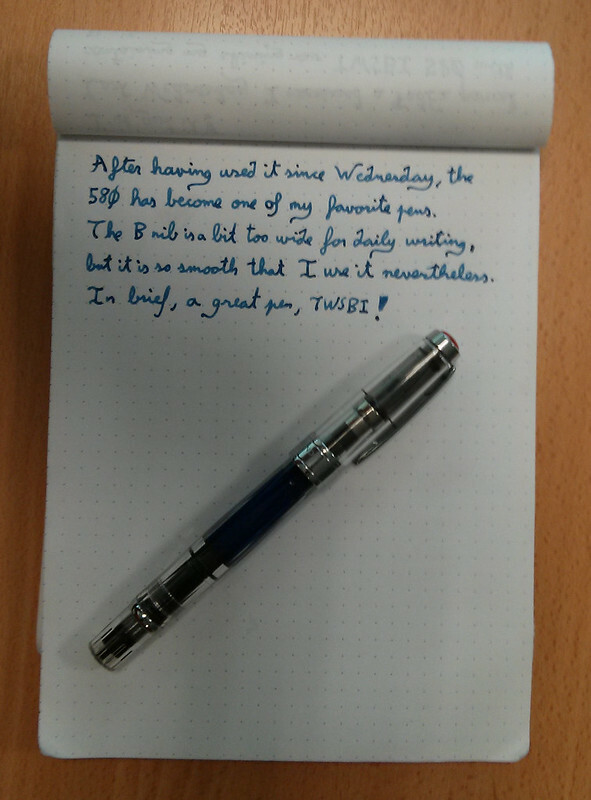 In brief, a great pen, TWSBI! 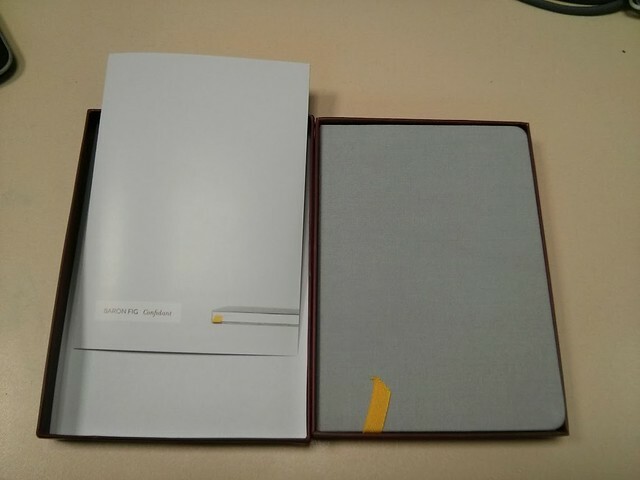 As usual, I've posted this review also in Fountain Pen Network. 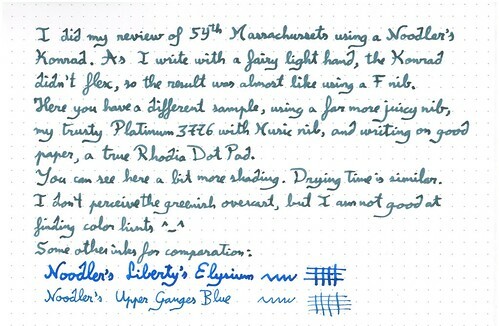 And today I review an ink as water resistant as the 54th Massachussetts, and almost as bright as Liberty's Elysium : Noodler's Upper Ganges Blue. I said almost, because as you can see here, Liberty's Elysium is still brighter. Upper Ganges Blue is indeed waterproof, it has passed the water test without any problem, neither the water drops of the splash test nor more than one minute underwater of the immersion test have altered this beautiful ink. As comparison, you can see how badly Liberty's Elysium supported water. Upper Ganges Blue really deserves the bulletproof label. Besides that it's a very beautiful ink, rather wet as I like, with a generous flow and only a bit of feathering on this Rhodia paper. Dry time is not bad, you must wait at least 10 s before rubbing your hand on paper if you want to be sure that it won't smear. Once dry, ink is inalterable. I really love this ink, for now it's my favourite blue, my almost-perfect blue ink. If only it could be as bright as Liberty's Elysium, it would be the truly perfect one. 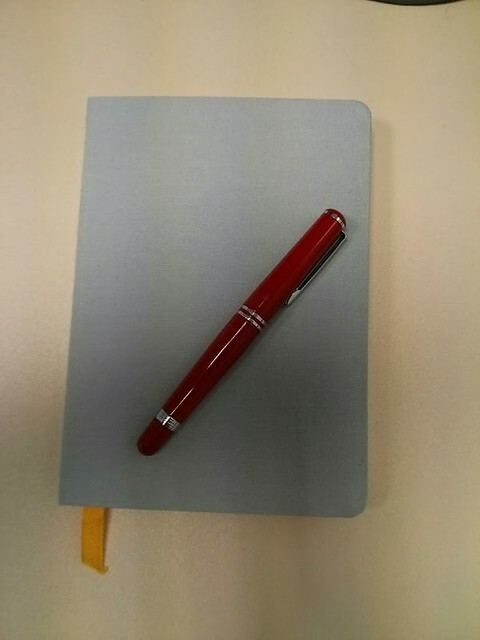 As usual, I've also posted this review on the Fountain Pen Network. 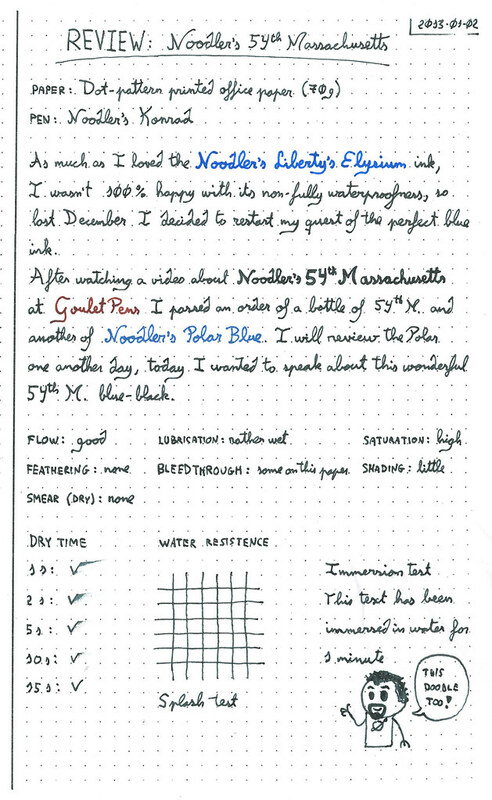 A quick complements to Noodler’s 54th Massachussetts ink review. I did the review with a Noodler's Konrad, and as I write with a fairy light hand, it didn't flex at all, so the result was almost like writing with a F nib. 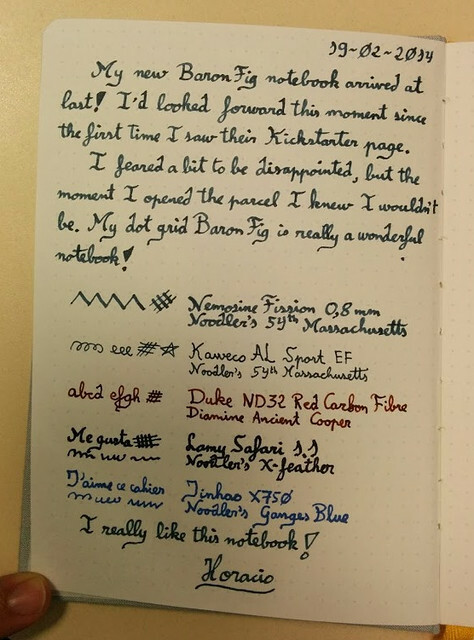 As inkstainedruth pointed at Fountain Pen Network, my review didn't show the greenish overcast that other reviews shown, and the F nib didn't show any shading. And as the paper used was cheap copy paper, it wasn't the ideal one to observe colors. Last week I received a pen that I had waited for a long time, a Noodler's Konrad Ebonite, and in the same parcel an ink I had wanted to test for a long time : Noodler's Lexington Gray. 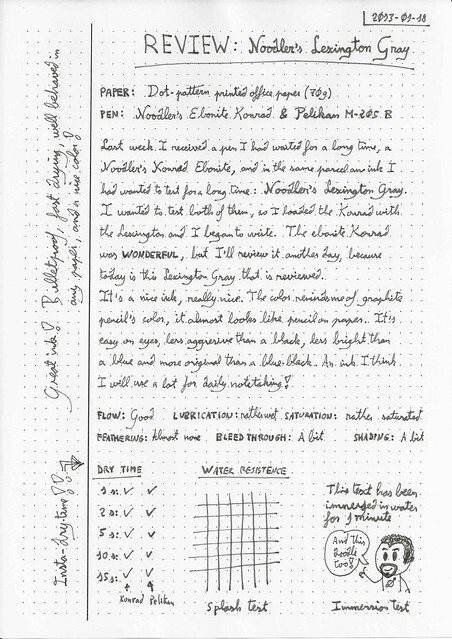 I wanted to test both of them, so I loaded the Konrad with the Lexington and I began to write. The ebonite Konrad was wonderful, but I will review it another day, because today is the Lexington Gray that is reviewed. It's a nice ink, really nice. 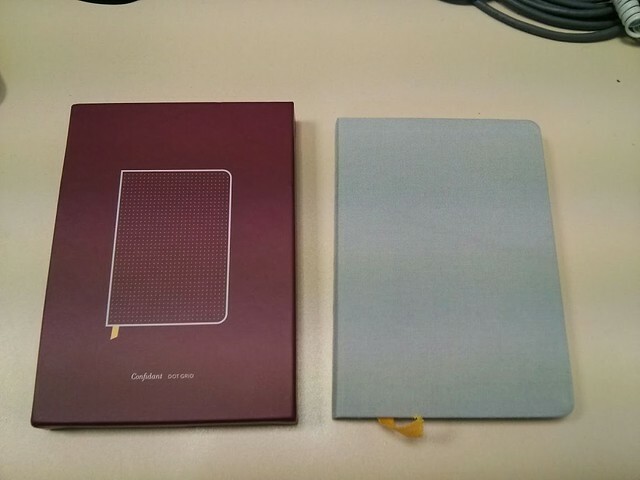 The color reminds me of graphite pencil's color, it almost looks like pencil on paper. t's easy on eyes, less aggressive that a black, less bright than a blue and more original than a blue-black. An ink I think I will use a lot for daily note taking. I was rather surprised by the ultra fast dry time, and by the good behaviour of this ink on almost any paper, specially on cheap paper. 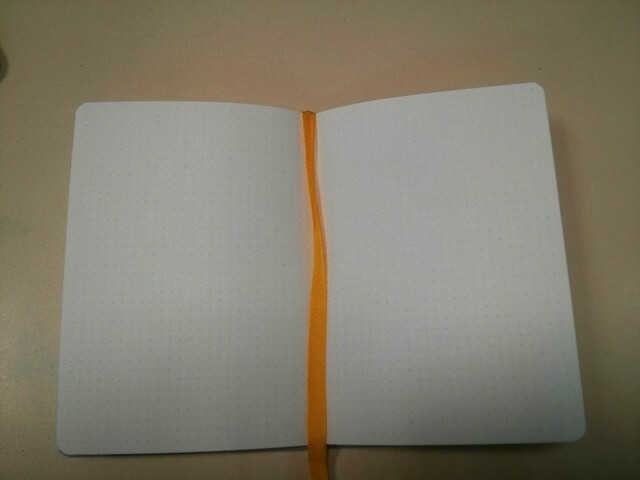 It's a great ink : bulletproof, fast drying, well behaved in any paper and a nice color, what else could you want? 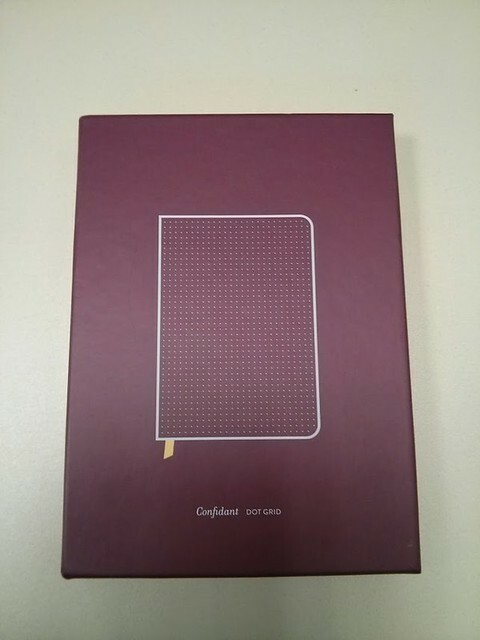 As usual, I've also posted the review on Fountain Pen Network. 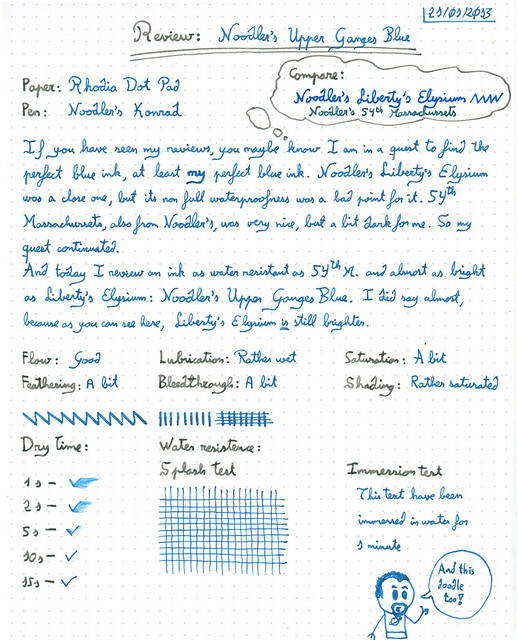 As much as I loved the Noodler's Liberty's Elysium ink, I wasn't 100% happy with its non-fully waterproofness, so last December I decided to continue my quest to find the perfect blue ink. After watching a video about Noodler’s 54th Massachussets at Goulet Pens, I passed an order of a bottle of 54th M. and another of Noodler's Polar Blue. 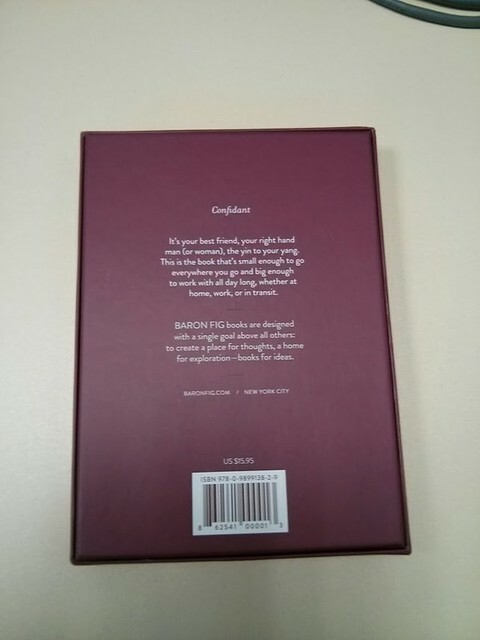 I will review the Polar Blue another day, today I wanted to speak about this wonderful and beautiful blue-black ink. The only thing I don't fully love is color, a bit to dark for me. It's very (very!) saturated, with little shading, I guess I'm going to dilute it a bit next time to reduce saturation and see if it does some shading and a bluer color. It doesn't feathers, even on bad paper, and that's a big positive point for me (and Polar Blue and its Black sister, aren't great on that area). It's waterproofness is really stunning, as usual in Noodler's bulletproof inks (besides Liberty's Elysium). 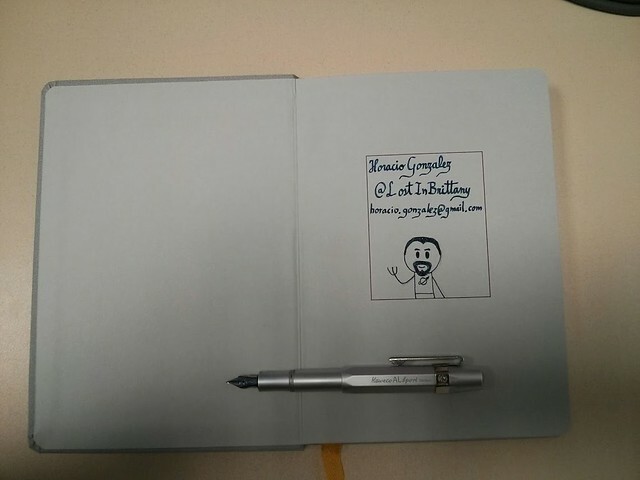 It flows good on my Noodler's Konrad, I had read it was somewhat dry or hard-starting, I haven't found it so. 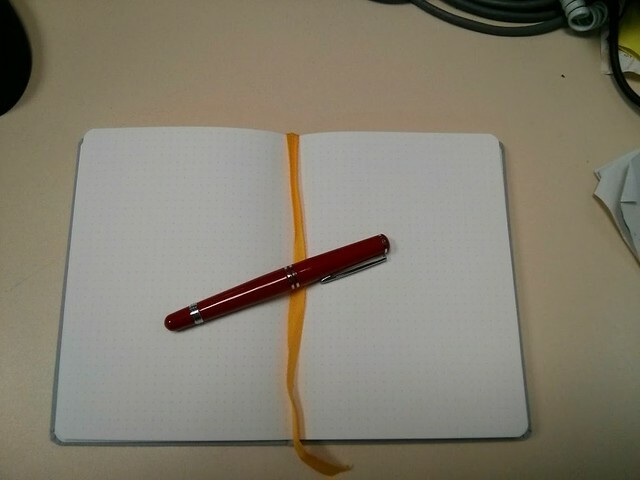 As usual, I’ve also posted this review in the Fountain Pen Network.